← Contingency and Convergence: Are the Gods Plagiarists? As we move from conspicuous birds of wetlands to more open country, such as desert and short grass habitats, other rules for plumage and behavior prevail. Many of the birds maintain conspicuous patterns, but revert to more bold black-and-white patterns. Some include the classic white eye-stripe and black V or U across the breast. Regardless, the patterns are bold and large, not fine and intricate. There are no flanks streaks or fine spots. These birds are painted with a wide brush. Nearly all are found on the ground, or near to it. These birds also have a tendency to stop and look from a rather upright alert posture. These patterns and behaviors extend across a wide range of species and continents. 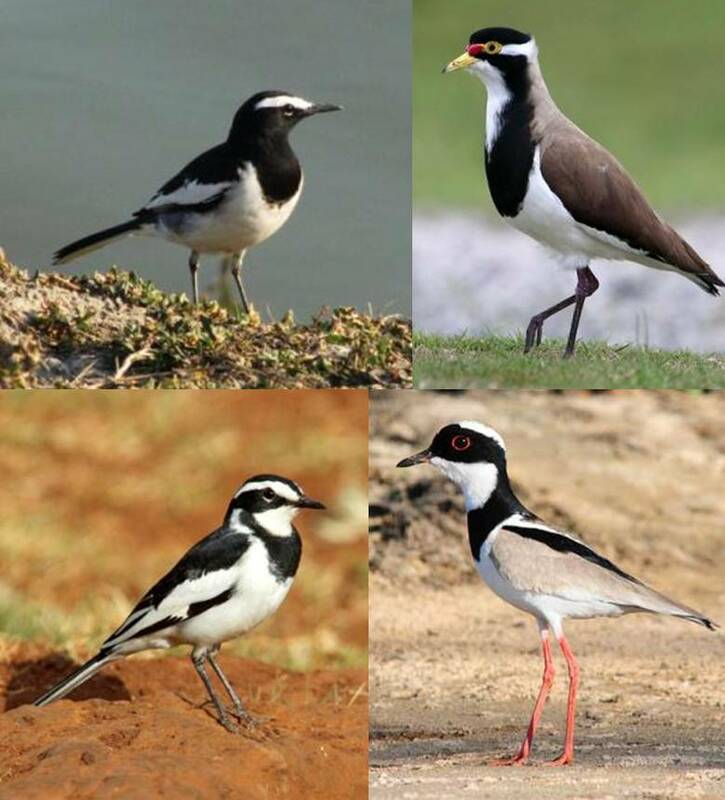 Note that plovers and wagtails last had a common ancestor 80 million years ago. Some have more pied appearances, with white faces framed with black on the nape and elsewhere on the body. These birds are frequent near water. Others are the opposite, with white caps and black faces. The tyrant is from the forest, but in relatively open contexts within that habitat. In very open country, some have black underparts, unusual in birds. Some feature white primarily on the side of the face (or the wing), while their underparts are black and upperparts gray or brown. In some, pale bills provide additional contrast to largely black heads. Another variation is a wash of black down the front of the neck to the belly, framed with white edges, often with the white bulging prominent at the sides of the breast. The upperparts are spangled gold or silver. These birds occur in short grasses. In some contexts, rusty red or orange is added to the mix, often across the breast or on the head (see the Chestnut-collared Longspur above). In very arid or open environments, the birds are pale white below, gray above, with just a touch of black (such as a dark eye-line or primaries), and a rusty cap. This entry was posted in Uncategorized and tagged birds, convergent evolution, desert, lapwing, plover, tyrant, wagtail, wheatear. Bookmark the permalink.